Sweet, sweet friends, I have so much to show today. I have some cool news to share here on May 3rd, 2017, honestly, you won’t want to miss it. It’s a sweet thing, quite unexpected – oh and there will be prizes. Can you come by? Next, I am over the moon thrilled to say that I have caught up on Day of Giving mailings. I’m so sorry that this piled up but I’ve had some help recently and am so blessed to be current. Have you been waiting for a card? In the right hand column I’ve listed all the cards and winnings that are already in the mail – most will be arriving by Monday. Today I’m sharing a card that I used flashy gold on for a graduation celebration but it just as easily doubles as an encouragement card. It’s dimensional but can be made as flat as need be. The card rests on a 5.5″ x 7.5″ base that is matted with design paper an gold. The focal image is made of several elements in my new Vintage Elegance Collection, which is back in stock. I used two of the Spellbinders Filigree Tag/Bookmark dies as an embellishment by trimming and letting the ends peek out on the bottom and the top. Next I ran velvet and gold ribbon across the card – ribbon hides so much of what is going on behind ;-). 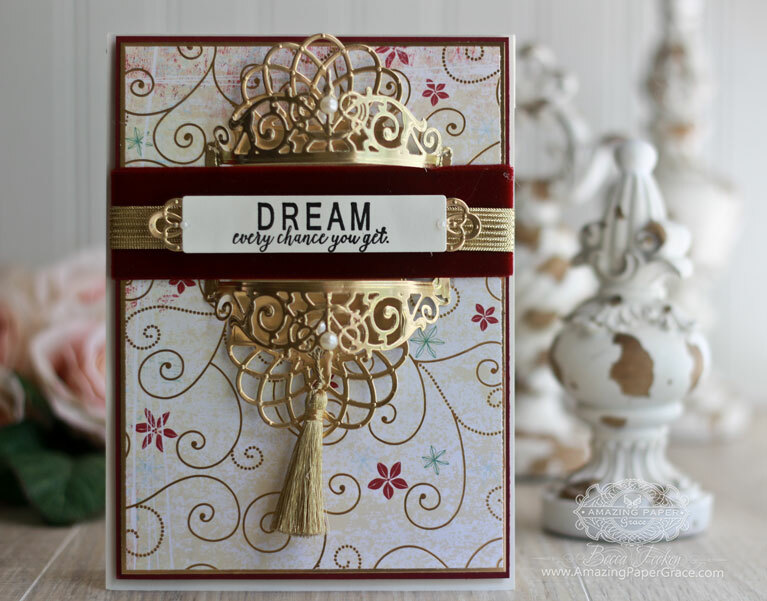 From the Spellbinders Beautiful Dreamer set, the die portion is cut as a frame, bowed to give dimension and glued behind the ribbon – it’s really quite regal. (I imagine doing this for a little girls princess card :-)) The sentiment is stamped on the insert that comes with Beautiful Dreamer stamp and die set and I decorated the ends with two of the tiny decorative tags from Spellbinders Graceful Tiny Tags. 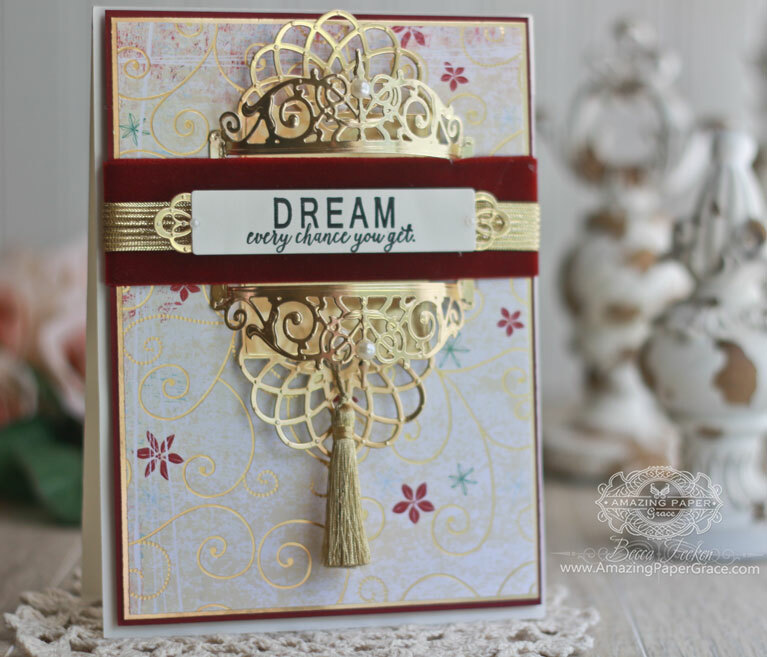 For this collection I was determined to have some smaller elements that could double duty as embellishments with lots of possibilities :-) Oh, and don’t forget the tassel – I think that’s what allows me to call it a Graduation card, lol! For new readers, every Friday it’s my pleasure to give away a card. The card goes to a randomly picked reader (worldwide) who leaves a comment in our conversation. Want to know more about Day of Giving, here’s a link to my FAQ’s just check out #11. You can check the list of winners HERE! I’m reminded this week that reunions are so inspiring and emotionally joyful! For your comment: What the most memorable reunion you’ve experienced – how did it make you feel? I can’t thank you enough for your patience. I’m mindful that sometimes you have to take a step back to take more steps forward. :-) I’m making headway on a number of behind the scenes projects that I really need to handle. I’m going to try to shake things up so that I can keep things covered while bringing new to the table. 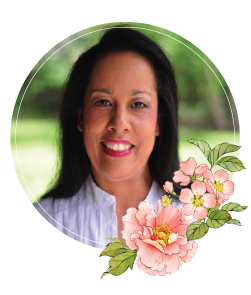 Please join me on May 3rd – I promised that this year I would be brave and that’s what I’m going to do! What a beautiful card!!! You really do think out-side of the box. Bold and gold accents really make your cards “more special” and the velvet ribbon, just over the top. Thank you for sharing! Becca: Such a beautiful card. I love the way the paper was highlighted with gold and the accents complimented. I love how you curved the middle of the card. I’m so used to seeing you gorgeous bows but the tassel was a nice surprise and reminds me to get mine out.. Gorgeous card! Wowee, Becca, I got goosebumps reading about May 3rd’s exciting news to come…can’t wait!!! It was fun to imagine how I would feel to receive today’s card…like I was crowned “Queen For a Day”! Love, love, love all the gold, the tassel and the red velvet ribbon is a luxurious touch. Absolutely regal. Whether I win a card from you or not, I am always a winner when you share a new posted design. Your dies are so classy–basic, versatile, and enduring. I have most of them and always look forward to how you re-use the old with the new. I’ll try this combination when the new dies come in the mail. 50th High school reunion was most memorable because everyone was a much kinder, caring, friendlier person than years ago. Aging has its benefits. Joni what a wonderfull Mum you turned out to be well done !!! Your way of dealing with this has meant that no one has been left out . What a beautiful card. I love the idea how you added the tassle for the graduation. My favourite reunion was when I went back overseas to my families country of origin & met up with aunts,uncles and cousins. It had been 20 years since I had seen them last. A happy & sad occasion as my grandparents were no longer around & it felt like something is missing. How wonderful it is, we live in a world were we can now communicate with someone overseas in an instant. This is truly beautiful and the tassel is a delightful touch. I’ve been missing as I decided to throw myself onto the ground and fracture my hip, so I’m walking rather slowly with the help of a zimmer frame!!! My memorable reunions are the ones every six months when I meet up with my crafting buddies from all over the U.K. and one even comes over from Europe, they make me feel so loved and happy. Unfortunately I missed this month’s because of my accident, but roll on October! My most memorable reunion was in 2016. We learned that my grandfather fathered a child in England during WWII. He never knew his father’s name, but had pics. As a result of Ancestry.com DNA, he found us. Then we found out that my grandfather fathered another son in Virginia. My dad thought that he was my grandfather’s only son. Last year, the three brothers met for the first time. It was amazing, and they are soooo much alike. I was excited, scared and extremely happy all at the same time for them. Your cards are always beautiful Becca, you always inspire me. Our happy occasion was when Hubby and i traveled out to NSW Australia to meet his brother and wife they had not seen each other for over40 years, it was fantastic and we had a BBQ on Boxing Day. Oh such elegance! This will truly make someone feel special! Hi Becca this card is very elegant ! friend the last few months it’s great . Glad to see you got all caught up, only I didn’t win. Actually, I’m a winner every time I see one of your cards. This is sure a little different than your usual – no Becca bow but the tassle is delightful in this instance. As far as reunions go, I will be attending Scrapbook Expo next week and that in itself is a reunion of all the friends you made the year or two before. But the end of May, I am going to New York for a week to attend my 55 year Class Reunion from high school. Hope there will be most of my fellow classmates there. I am the one who always travels the farthest to get there. Know I will enjoy it as the last time I was there was 5 years ago. Enjoy your timee in Canada, Becca. Oh my wow what a gorgeous card!!!!! The designer paper enhances your beautiful die cuts perfectly!!! Gorgeous card with beautiful details and sentiment! Love the gold! Yay for getting caught up! I love seeing your cards Becca. They are truly a blessing to me. I had a lovely reunion some years ago with a childhood friend. We met at a local restaurant, and she even brought her mom, who was besties with MY mom. The reunion brought back a flood of wonderful childhood memories! My first thought was there’s no BOW! But then the next was, still looks like a Becca card, would know it was her’s anyway. Actually it’s gorgeous and I’ve got an important graduation coming up, so thanks for the inspiration. Will be looking forward to what you’ve got to share on the 3rd! What a stunning card Becca. Of course I noticed there was no bow right off, but the tassel makes up for it. Thanks for sharing. What a wonderful graduation card! So elegant and yet very celebration-y. Just beautiful! Good morning Becca, you really are amazing!!! I went to my Auntys 80 th birthday last year her mum my grandma had six daughter’s including my mum, so you can imagine all the families it was a fabulous get together!!! It’s sad we don’t meet more often!!! Thanks Becca and Bless you!!! Once again a gorgeous card, Becca! 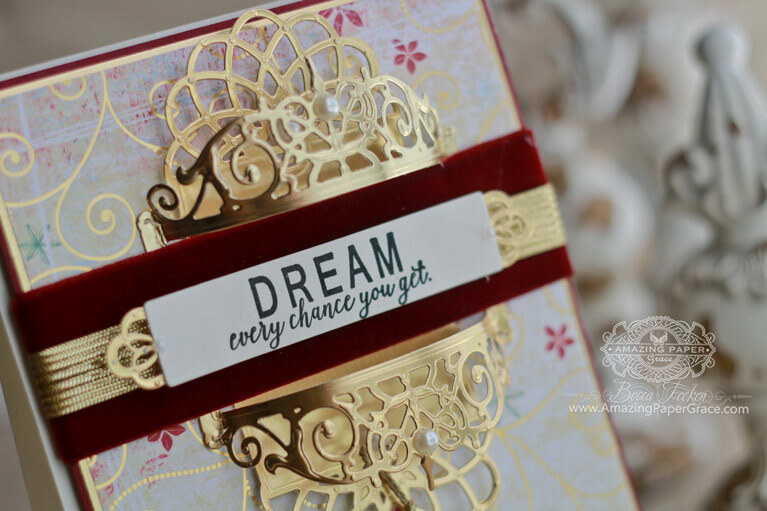 The gold accents, the pretty ribbon and lovely design paper you have used – it’s all so beautifully put together! Morning Becca, Another gorgeous card !! At first glance the die-cuts above the ribbon reminds me of a ‘tiara’, truly gorgeous. I hope u read this!! In December 2015 I was able to make the trip to see my dear friend Deb. We only had a few days together but that Christmas Day was the most wonderful gift I could ever ask for. I had seen her before I moved in May 2014, so getting to go be with her at Christmas was ever so special because she usually would go to her brothers for the holidays. The day after Christmas she and I had so much fun doing what we do best!! I taught her how to use her Anna Griffin minc machine. This is the best part…. she had several packages open but not all the way opened. So I started snooping (with permission of course) and she had the fuse by WeRMK and lots of good stuff to do with it, she had totally forgotten she had this! I have one and knew what all it could do so I was able to share what this tool could do, of course the card stuff she had to use with the fuse was right up her ally!! What a wonderful time, now she is with God and our next reunion will be one of rejoice! Hi Becca a beautiful card as always hoping your are going to be showing us some new dies, Or better still that you have won some prize in recognition of your your talent . Such a beautifully regal card, Becca! Love the gold and the velvet ribbon over those layers! A family funeral was the occasion which brought about a reunion of all the cousins who had grown up together, but moved away. Such sweet sorrow. It was a reminder that we should do today – not put off till tomorrow those opportunities to reconnect with friends and family!